Everyone has been visiting our one & only Sahara - G B Pant Hospital. 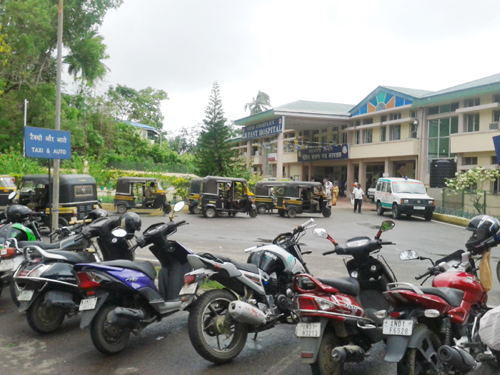 We can see the entrance gate of the GBP Hospital occupied by Auto Walas and other Private Vehicles. 24 hr many emergency cases like accident/ serious patient/ doctors on emergency call comes to Hospital, but the ONLY Enterance Gate is occupied by these auto walas who instead of being provided the auto stand keep their autos, Moreover all the vehicles directly comes to the gate let it be the OPD Patient or the visitors. The hospital has more than approx 20 security guards sitting idle on the benches, they are least bothered to help the needy patients, which you all could have seen. The guards at the entrance gate are not bothered about the seriousness of the vehicle coming to the Hospital, any delay can cause severe danger to the patient's life, because a delay of second can take Life. Only Vehicle with the Causality/ Serious Patient/ Ambulance and Doctor’s Vehicle should be allowed till Gate. Rest of the vehicles to be stopped before Entrance Gate and keep the road free for Vehicles. The Traffic Police has also been posted there for smooth traffic flow, but in vain. If the person violating the rule is challaned and if the Security Guard stops all the vehicles before the entrance a smooth functioning of traffic can be done. A notice board can also be displayed. I hope the Director DHS will immediately take necessary action, because it is said – “Prevention is better than cure”.